Parker Pup is not your every day 7 year old golden retriever. 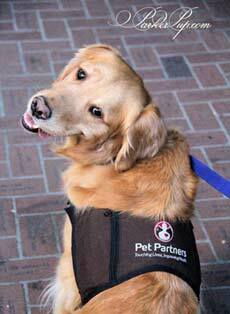 He’s a Pet Partners-registered therapy dog. He’s a spokesdog for cancer prevention. He’s an accomplished model. He’s a talented actor. And, in his free time, he even finds time to race around obstacles as an agility dog, surf and try to convince everyone he meets that they should throw a ball to play with him. The work he is most proud of is that which he does as a therapy dog, Parker works regularly with children, cancer patients, and adults in various hospitals. He also does Read to the Dogs at Beaverton City Library, and visits various schools. Lucky for us, Parker Pup was kind enough to take time out of his busy schedule to do an interview with Canine Journal so you guys could get to know him better! How did you find your forever home, Parker Pup? I was adopted when I was 8 weeks old! I don’t remember much since I was so little but I remember being loved from the very start by my entire family and my big sisters, Daisy and Sophie. How would you define your cause and when did you get your started working on it? My biggest cause is cancer. I do my best to raise awareness for both human and canine cancer. My 2-legged dad was diagnosed with an aggressive form of cancer the year before I came into their lives. It’s because of him that I am a therapy dog. I spend part of my therapy visits working with cancer patients and trying to make them smile and provide comfort. Then a year and a half ago my big sister and best friend, Daisy passed away from lymphoma. I could go on and on with people and animals we have known that have battled this disease. Because of all of the ways cancer has touched my life, I spend a lot of time trying to raise awareness. 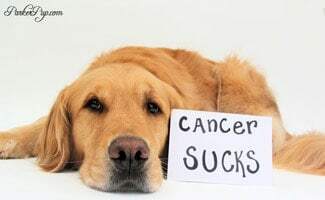 1 in 4 dogs will develop cancer and 60% of golden retrievers will be faced with a cancer diagnosis. I have a vest that I wear to cancer events that has over 2,000 names of people and animals who have battled the disease, and because of this I have raised over $20,000 for different non-profits and ground-breaking research. I love Nutro Crunchy Treats (Berry!) and I also love my Lickety Stick! So many events have been awesome — all of the cancer walks have been amazing. I think the most incredible event was in Los Angeles. I was invited to a black tie Gala celebrating Betty White and her dedication to one of my favorite non-profits, Morris Animal Foundation. She and I became quick friends, and I got to hang out with the amazing people who make Morris Animal Foundation what it is today! An incredible organization full of absolutely incredibly selfless people. My heart. I think that’s what makes me a good therapy dog. You got a lap? I’ve got a chin. There are so many dogs out there these days making positive differences but I think my favorites are Ricochet and Rina. They do so much for so many and their hearts are pure. Follow your heart. Don’t set out to do something because you see others doing it. Life is about living it and doing things you’re TRULY passionate about! Above all else, always always always be kind. If you enjoyed this article, just imagine how much fun you will have hollowing Parker’s antics every day on Facebook and his website.